Yes, I admit it. I’m not fond of cabbage, but I love corned beef! And it’s time to celebrate the “green”. Which led me to experiment. Many of the brassica family are grown as microgreens – a way to get that tangy flavor and crunch packed with nutrition. Could a few cabbage shoots give me that traditional taste without overpowering me? Two weeks ago I planted red cabbage seeds on the window sill at the office. Last weekend (just 8 days later), it was time to harvest the shoots, and cook the corned beef. I don’t have a standard recipe to prepare corned beef – each time it varies slightly. But I do write down each change I might try (just in case I discover the perfect recipe). Every few years we host a small gathering on St. Patrick’s Day of other couples who spend their lives “playing in the dirt”. So this was my opportunity to practice. I’m not very good at photographing food, but it turned out to be the best corned beef dinner I’ve ever made. If you want to give these microgreens a try, start by filling a shallow container with soil-less mix and water it well. Sprinkle any variety of cabbage seeds over the top of the soil and press the seed down so they make good contact with the soil. Place the container on a sunny window sill – no need for grow lights. Mist the top of the container daily – no need for fertilizer. Harvest the greens at the soil level at any stage of growth from tiny sprouts to a few true leaves tall. Here’s my best recipe for the corned beef. I cook the way my grandma did; a pinch of this and a hand full of that so these measurements can be adjusted to your taste. I slow cook corned beef in a crock-pot, but stove top or dutch oven is better for a very large brisket. Drain the brine from a 4-5 pound brisket (I prefer a flat cut) and rinse in cold water. Slice 2 medium onions and place on the bottom of the crock-pot. Rub the brisket with 3/4 cup of brown sugar and place on top of onions. Add 2 cloves garlic (sliced), 1/2 stick cinnamon, 1/2 teaspoon whole cloves (approx. 8), 1/2 teaspoon course cracked black pepper, 2 whole bay leaves, 1 teaspoon whole yellow mustard seed, 1/2 teaspoon whole coriander seed, pinch of red pepper flakes. Pour 2 bottles of Guinness Draught (not stout – it’s too bitter for long cooking times) slowly around and over brisket. Add enough water to cover the meat. Set crock pot to med-high for 7 hours. When meat is done, ladle out 2 cups of liquid into a stock pot and add 4 cups of water. 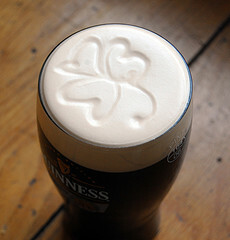 I do this because cooking the vegetable in the Guinness broth turns them very brown in color. Peal and quarter 4 carrots and 3 potatoes. Simmer veggies in broth and water until tender (approx. 15 minutes). If you want to include cabbage, add it to the veggies the last 5 minutes. Slice corned beef across the grain, top with cabbage microgreens and serve the veggies on the side. And don’t forget the traditional libations! 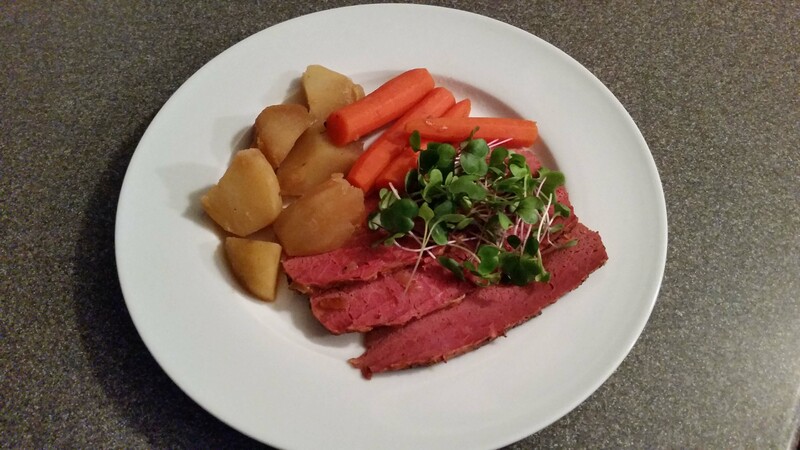 This entry was posted in Garden Fresh, Garden Fresh Recipes and tagged cabbage, cabbage microgreens, corned beef, corned beef and cabbage, corned beef and cabbage microgreens, corned beef recipe, St. Patrick's Day, St. Patrick's Day dinner. Time to Plant the Peas! Well – Maybe Not Outside.